This is the first model of Air Jordan that made the Nike AIR visible (as well as the first with the JUMPMAN logo). They were originally sold in early 1988, and sold for $100. The sides also included decorative artificial snake skin. The Michael Jordan "JUMPMAN" logo is on the tongue (not easy to see in this picture). Original Air Jordan 4 shoes were made in 1988, and sold in early 1989 for $100. 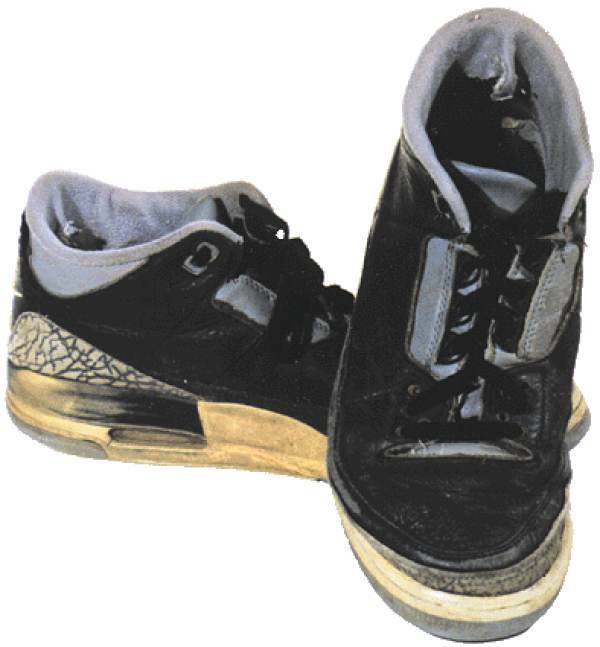 Note that the Air Jordan "JUMPMAN" logo is imprinted on the shoe sole as well as the tongue. 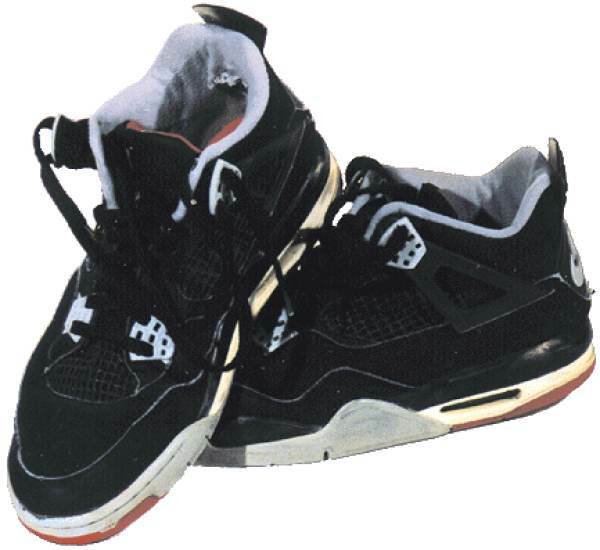 Originals were made in 1989 and 1990 and sold for $125. Reissues came out in 2000. 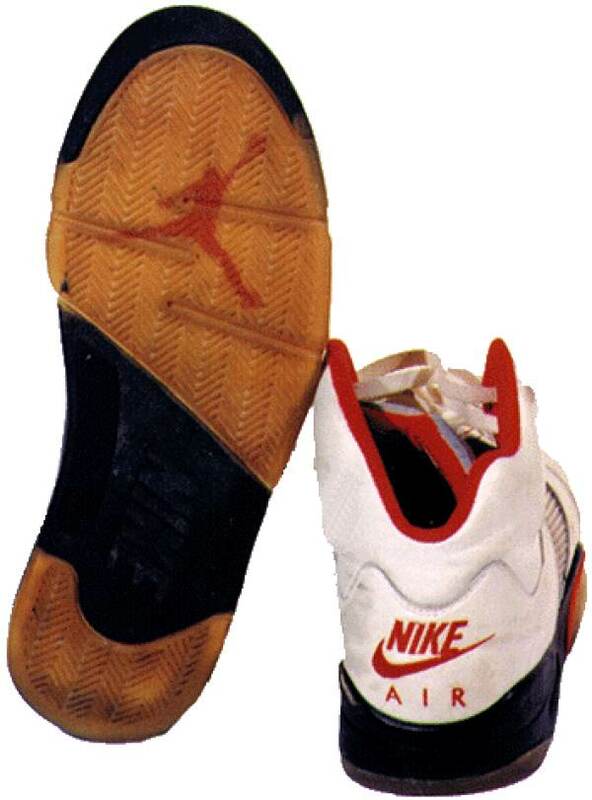 The Air Jordan 6 was the 1991 version, and it originally sold for $125. The Air Jordan 7 was the 1992 version, and it originally sold for $125. 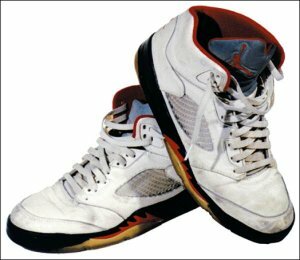 Most versions had "23" on the heel, but they also made a version with "9" on the heel, for Michael's jersey number at the 1992 Barcelona Olympics (the one known for the "sweats with the Reebok logo" flap, where many of the Nike endorsers engaged in various tactics to obscure the Reebok Vector logo). An Air Jordan 7 with a "9" on the heel is a rare and highly desirable version. This is the early 1993 version, and it originally sold for $140. These are well-known for the two straps that go across the vamp.